As I'm sure many of you will be aware, October is Breast Cancer Awareness month. It's a cause that is very close to my heart and it affects so many women (and even men) each year. In honour of the cause, I decided to think about what pink essentials I'd put together for a pink pamper night. So many beauty brands usually release products at this time of year with proceeds going towards breast cancer research so it's the perfect time to throw one into your pamper routine. 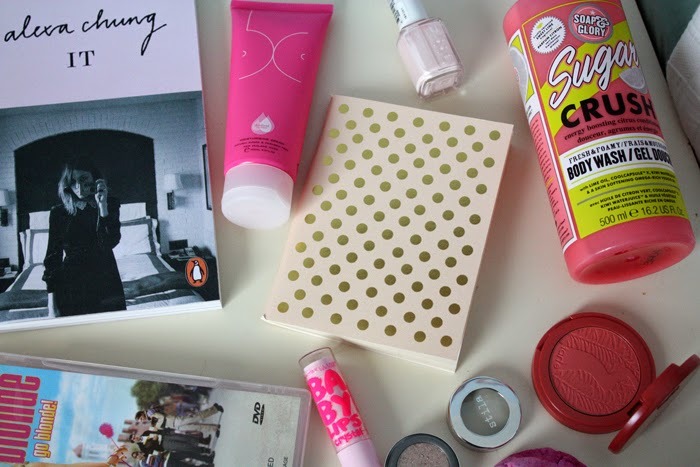 Here's my essentials for a pink night in..
No pamper night is complete without a myriad of treats. Might I suggest you add some Pinky bars or strawberry Tim Tams to your lineup. I didn't have any on hand but they're so delish! I like to start the night off with a bath so I usually use one of my favourite bath bombs or bubble bars from Lush. If you're not a bath person, hop in the shower with a scrub or sweet scented body lotion. I love the Sugar Crush body lotion from Soap & Glory. To read I opted for It by Alexa Chung for insights on all things Alexa. The newest step to my routine involves the Skinfood Breast Cream*. It's been released this month to help women get to know what is 'normal' for their breasts. It's an extra step in the routine but hey, it could save your life. The cream happens to smell great too and $2 from every cream sold goes to the Breast Cancer Foundation. Pyjamas on and it's time for my favourite girly, pink central movie, Legally Blonde. "Whoever says orange is the new pink is seriously disturbed". I'll apply my favourite new Baby Lips in the shade Pink Quartz, reach for pink nail polish and maybe even this gorgeous dusky pink eyeshadow from Stila. After all that I'm probably getting a bit tired. This girl ain't a partier so it's time to call it a night and dream through rose tinted lenses..
*PR Sample. Note-This post is in no way sponsored. Like I said this cause means a great deal to me and I felt this product deserved to have some awareness raised about it because let's face it breast cancer (no, cancer in general) takes the lives of far too many people. If getting to know what's 'normal' for you and your body has a greater emphasis on our lives then maybe we'll see that statistic decrease. My pink pamper night essentials are MOR Tangelo & Grapefruit body creme (smells SO good), a sing-along movie like Pitch Perfect or Grease, and a bag of bright pink candy floss - yum! My pink pamper night essentials are Lush's 'The Comforter' bubble bar.. it's absolutely divine! Pinky Bars are a must although I'm trying to cut the sweet stuff out (sad face).. so I guess appropriate for the summer months would be a healthy alternative such as watermelon! My pink pamper night essentials are candyfloss, cupcakes, romance movies, clay masks & a bath using my friends homemade soap (ooh the smells).